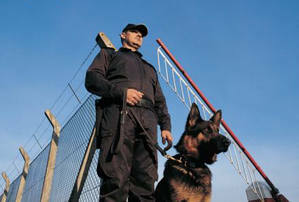 A well-trained, properly handled dog is one of the best deterrents in security industry. We have a breeding programme to raise our own German Shepherds and Rotweillers. We favour this breeds because of their size, strength and fearlessness when faced with multiple intruders.Clearly a competent Guard Dog is nothing without its Handler. The same attention to detail goes into Handler training and both Dog and Man are permanently ''teamed'' to offer a key part of your security defense.